As much as I respect Illich and Sanders, the sentiment they express in their preface to ABC, bemoaning the disintegration of language into information, is not helpful. Ironically, literacy (that is, the skills involved in managing the technology of writing) is not, historically, the way in which people prevent language from turning into information, but precisely the way in which language becomes information. This image, for instance, is an example of very early writing: a clay tablet from Mesopotamia, c 3000 BC. Is it a snippet of ancient wisdom, perhaps, or a piece of deathless poetry? No, it is very probably a record of grain distribution. Literary scholars may find it deflating to realise that the very earliest records of writing in human history seem to have been produced not by poets but by accountants. Almost four millennia after the Mesopotamian clay tablet, here is another example of the dissolution of language into information. This is the first canon table from the Lindisfarne Gospels, produced in northern England, c AD 700. The four gospels have been broken up into numbered sections (following a system devised by Eusebius of Caesarea in the 4th century) and the numbers for parallel sections have been arranged in tabular format. But the decorative scheme of the table invites you to approach this book as if you were entering a building with beautifully ornamented pillars and arched ceilings. The text of the gospels is presented as meaningful space: not so much a linguistic structure, as an architectural one. 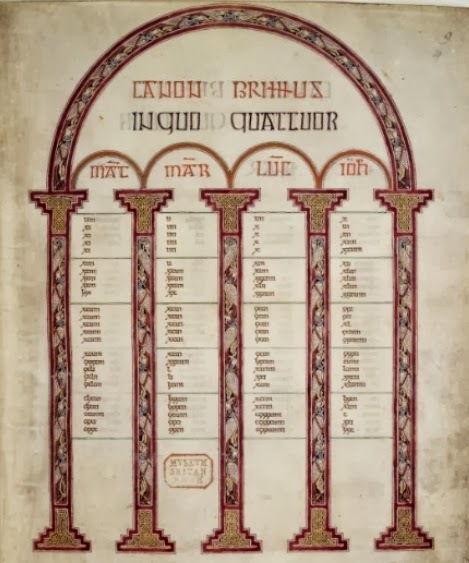 The canon table is a guide to the text: precisely by presenting the gospels as an information system, it suggests a way of navigating knowledge; by reminding the reader of sacred space, it hints that the purpose of reading is the attainment of wisdom. Technology is a product of the human imagination. Writing is a technology for encoding information. As T. S. Eliot points out, information is by nature reductionistic. It leaves out a great deal that should be important to us as human beings: knowledge and wisdom, for example. But seeing the information value in, say, medieval texts is not to reduce them to mechanisms; rather, it is a powerful way to remind us of the human dimensions of historical technologies. Throughout history, people have repeatedly felt that information threatens to overwhelm the essentials of humanity. The best way to deal with that anxiety is not to resist information technology, but to understand it. ‘Administrative tablet [Southern Mesopotamia] (1988.433.3).’ In Heilbrunn Timeline of Art History. New York: Metropolitan Museum of Art, 2006. Brown, Michelle P. The Lindisfarne Gospels: Society, Spirituality and the Scribe. Toronto: U of Toronto P, 2003. Eliot, T. S. Collected Poems 1909-1962. London: Faber, 1963. Illich, Ivan, and Barry Sanders. ABC: The Alphabetization of the Popular Mind. New York: Random House, 1988. Spar, Ira. ‘The Origins of Writing.’ In Heilbrunn Timeline of Art History. New York: Metropolitan Museum of Art, 2009.